Sheffield based company Forced Entertainment has been around for almost 30 years but somehow their shows are getting more and more messy. Anarchic performance style and black humour are their trademark as they often question on stage the act of performing or the narrative itself. During the first 20 minutes of their last show The Coming Storm, there was only one microphone for six performers who had to vie for it to get their voices heard and stories told. They kept repeating: ‘A good story needs…’ cuting each other off in full flow or interrupting with sleazy drum and a perfunctory piano accompaniment. The story continues on a 24 hour Quizoola! edition at the Barbican April 12th and 13th. 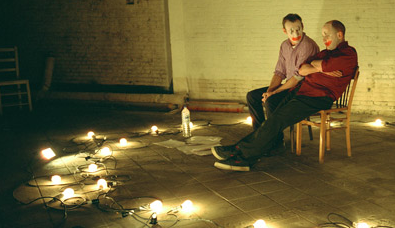 Alternating pairs of performers will sit in a circle of lights wearing blurred clown make-up and ask each other an avalanche of questions. It will be a participative experience as the audience is invited to submit up to 10 questions in advance. With 12 hour and 24 hour tickets available, the audience can come and go as they please over these periods and check whether or not their questions were posed.